EVENDALE, Ohio -- While other kids their age were playing video games or going to the pool, Garrett Treon and Dominic Infantino were learning how to make their community a better place. The boys were among 25 middle-school students who spent a week this summer at Camp Give , a program of Evendale-based Magnified Giving . The point of the camp was to teach children as young as seven what it means to give back, whether that is through volunteering or donating to nonprofit organizations they support. "I learned about philanthropy, which is giving your time, talent and treasure back to the community, and the love of humankind," said Garrett Treon, a 12-year-old who will be a seventh-grader at St. Michael Parish School in Sharonville. "And I also learned that random acts of kindness make people feel really good." The kids spent most of the week learning about three different nonprofits and doing hands-on volunteer work. Then, on their last day, each camper voted on which nonprofit would get his or her $50 donation through Camp Give. This marked the second summer for the camp, which Magnified Giving divided into three different sessions. The first week, in mid-June, was for children who will be second- and third-graders in the fall. The second week, in late June, was for students who will be in fourth and fifth grades. Garrett and Dominic attended the camp for students entering the sixth, seventh and eighth grades. • Gorman Heritage Farm , a working farm in Evendale with a mission to educate people about agriculture, nutrition, sustainability and the environment. They packed hundreds of sacks of food for Childhood Food Solutions, helped weed the gardens at Gorman Heritage Farm and learned about affordable housing at Peaslee Neighborhood Center. "I liked learning about a lot of nonprofits," said Dominic, 13, a student at St. Columban School in Loveland. "In the junior high, you have to get service hours, and you go to a lot of organizations to do service. And I feel like it's good to have a step up and know a lot of organizations." 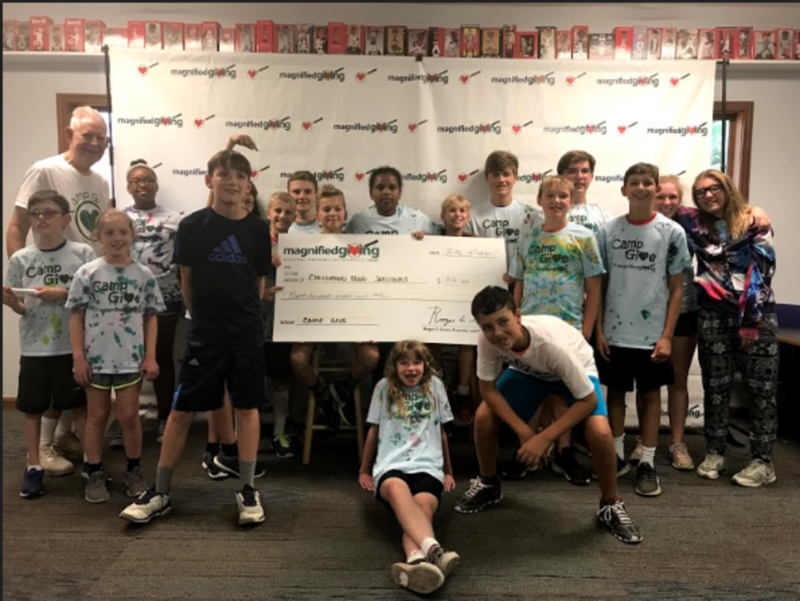 The two groups of younger campers voted to divide their money equally among all three nonprofits, Camp Director Caroline Ray said. A few of the older students voted that way, too, but the majority directed their donations to Childhood Food Solutions. Dominic said he picked Childhood Food Solutions because "it helps all around the Cincinnati community." Garrett did, too, and said he was surprised that there were so many kids experiencing hunger in the region. "I didn't realize that it was this big in Cincinnati," he said. "They don't get food on a daily basis. I am very fortunate that I get this, and sometimes I take that for granted." 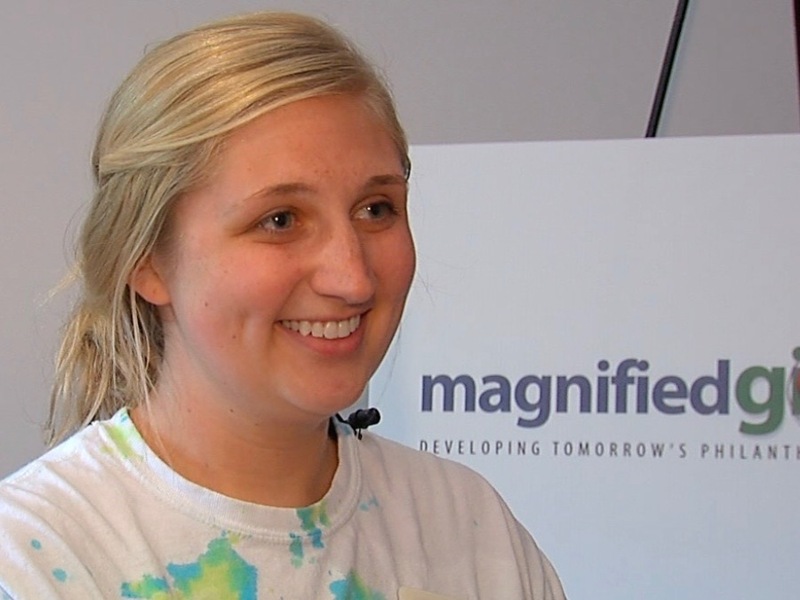 Magnified Giving structured the camp so that all of the nonprofits would get funding. For the week that Garrett and Dominic attended Camp Give, Childhood Food Solutions got $816.66 while Peaslee Neighborhood Center got $266.66 and Gorman Heritage Farm got $166.66. For all three weeks of camp, Childhood Food Solutions got a total of $1,333.32, Peaslee Neighborhood Center for $783.32 and Gorman Heritage Farm got $683.32, Ray said. The campers got to be there for the check presentations to the nonprofits. Seeing that their work and their votes had an impact makes a big impression, Ray said. "I think it's a game changer," she said. Ray knows that first hand. When she was a student at Mount Notre Dame High School, she took part in her school's Youth Philanthropy Council sponsored by Magnified Giving. "As a student, it changed my life," said Ray, who will start a new job as a teacher at Roger Bacon High School in the fall. "What was most powerful was I learned that as a teenager, I could make a difference, that my time was worth a lot to someone, my talents are worth a lot to someone. I think that's something every single teenager should learn." Of course, not every teenager will grow up to change the world, Ray said. However, Roger Grein, the founder and president of Magnified Giving, built the organization on the belief that helping young people understand the power of philanthropy will create more caring citizens and stronger communities. He started by working with college students and then moved the program into local high schools. 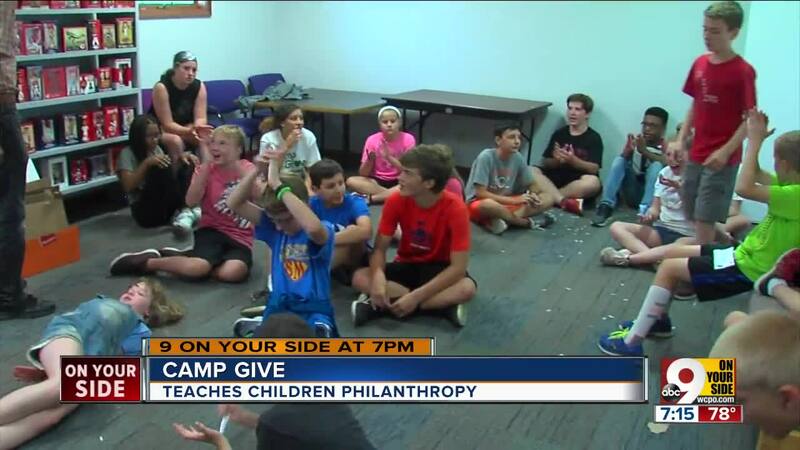 And now Camp Give allows even younger kids to learn the importance of giving back. Ray said all the camp's activities are designed to educate the campers about the importance of community, what it means for people in communities to support each other and how they can be part of it all. "I hope that they become future leaders and that they make their community a better place," she said. "My goal is to plant that seed." The seed is taking root if Garrett and Dominic are any indication. Both boys attended Camp Give for the first time last summer and liked it so much that they wanted to come back. 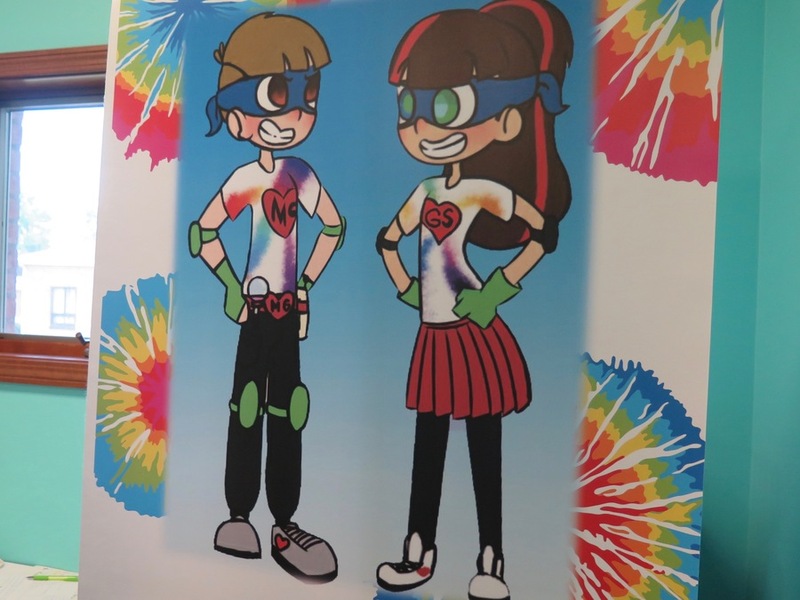 Garrett is such a fan that he developed comic book characters for Camp Give -- a boy named MagniGiver and his sibling sidekick, Sister Giver – that Magnified Giving has used in its marketing materials. Dominic liked Camp Give so much that he also worked as a counselor for the fourth- and fifth-grade campers in June. "I had a fun time," Dominic said. "They looked like they were really into it." That's the thing about learning how to make a community better. Helping others and those random acts of kindness seem to have a snowball effect, even in the hottest days of summer. "It's just contagious," Garrett said. "When you do a random act of kindness for someone, that person will want to do a random act of kindness and it will just keep on spreading." 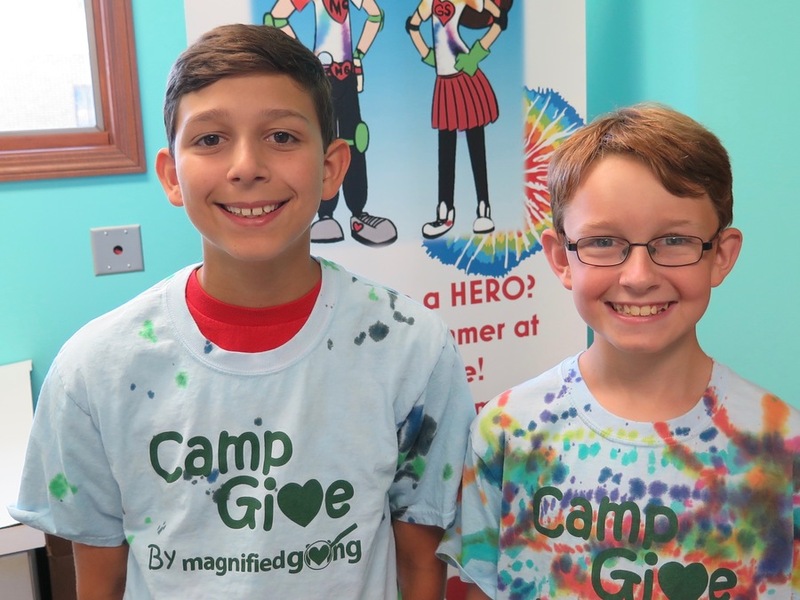 More information about Magnified Giving and its Camp Give program is available online.